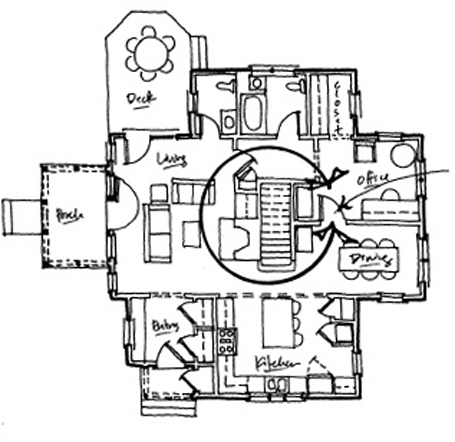 For a home design to be successful, it must first satisfy a homeowner's program, which is the design's spatial criteria. The program often takes the form of a list, describing each desired room/use, the approximate amount of square footage assigned to each, and the relationship of each to other rooms/uses, environmental forces (like sun and breezes), and/or the site. Think of the program as the building blocks of your home design -- whether your home will be new construction or a renovation/addition. Your program will be unique to you. It should reflect how you would like to experience your home. Edit it, and edit it again to be sure the spaces and relationships it includes are true to your lifestyle, not your parents' lifestyle, not your neighbors' lifestyle, not the imagined lifestyle of some unknown potential future buyer. If you're drafting a program for your home project, you might want to visit the homework section of the KHS website. There, you'll find a number of questions that will challenge you to hone your program. Visit the KHS design process page to to get a sense of how your program fits into the overall design process. In what does the architect say? Found on many a homeowner's wish list, the clerestory window is one which is placed above an abutting roof line and, as such, is well above eye level. We designed small, square, awning clerestory windows for the Brewster Long House, pictured here, which draw daylight from above, deep into the dining area below. One of the beauties of the clerestory window is that it can welcome daylight and views of treetops, mountains, and sky, but typically not views of neighbors or a home's occupants. Clerestory windows are often confused with transom windows. Transoms are ganged directly above a door or window. Both admit daylight from above. Clerestory windows generally draw daylight deeper into a space since they themselves are usually positioned deeper within a space. Today's word is massing. Building massing refers to the three-dimensional forms which comprise a structure. Massing, for example, can be compact, charaterized by forms tightly arranged around a central form, or winged, in which forms branch off in a wing-like fashion, or perhaps linear, in which forms are aligned, or nearly aligned, end to end. Generally, architects aim to balance massing. Ideally massing is legible, such that the distinct forms communicate meaning in relation to each other. You may be familiar with the book Big House, Little House, Back House, Barn: The Connected Farm Buildings of New England. It illustrates the connected massing of 19th century farm buildings in which the Big House, which was the main house, could be understood in relation to the Little House, which might comprise a kitchen, to the Back House, which might contain additional space for in-home industry like cheese making, to the Barn which was the primary location for agrarian enterprise. The arrangement of the massing of these distinct elements communicated what happened within each component and the relation of each to the other. 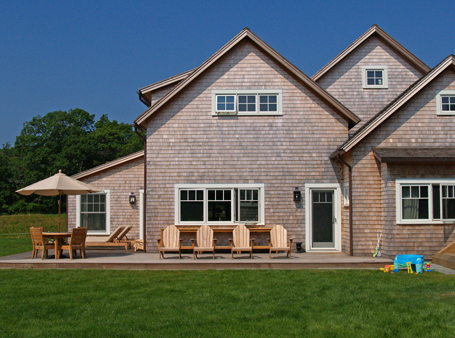 In the image above of the West Tisbury House, we arranged the massing of the home such that three overlapping gable forms of different height and width communicate a similar hierarchy of sorts. The distant tallest gable contains the main house (Big House); the one and one-half story gable to the left is the Little House (kitchen and more); the single-story gable to the right is the Back House (ancillary living space); And, in this example, there is no Barn. 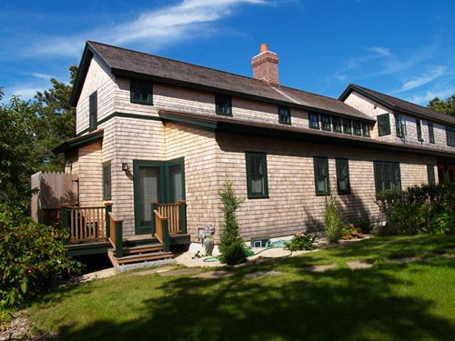 When designing a home, massing is one of the first characteristics an architect considers. You may have seen the curiously captivating "What does the fox say?" viral video created by Ylvis, a pair of Norwegian brothers. It may have gotten you wondering in earnest, "What does the fox say?" Or, "Why don't I know what the fox says?" I'm not trying to get existential on you. The song got me thinking about another creature whose method of communication may seem elusive to others. Yup, the architect. So with this post, I'm starting a new House Enthusiast category to help demystify and clarify some of the more elusive terms that residential architects bandy about. I don't want to squander time delving into esoteric archispeak. I want to focus, instead, on terms that are actually meaningful and might benefit you to know as you work on your residential or other creative architecture project. Let's get started. Today's word is enfilade. Rooms are enfilade when openings (generally doorways) in a series of rooms are arranged along a continuous axis such that there is a view through the openings, ideally to a distant vista. This can be both a useful way-finding circulation device and an enticement to draw occupants through connected spaces to a rewarding view or daylight. 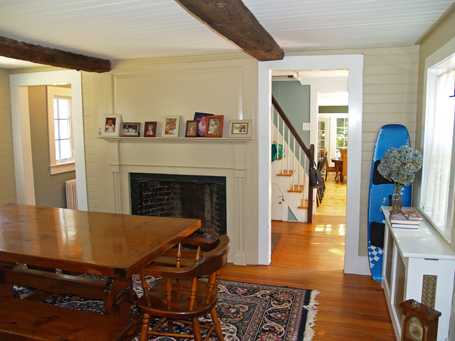 In the example above at the Yarmouth Port Antique Cape Renovation/Addition, we positioned the new doorway to the new kitchen addition, which is a couple of steps below the main living level, so that folks in the now more distant original dining room would be visually connected to the kitchen path and the backyard view. In general, circulating through openings in rooms, rather than hallways, offers a more rewarding, expansive experience to those making the journey. Interestingly, dictionary.com informs me that in french "enfilade" comes from "enfiler" meaning "to thread on a string, pierce from end to end". Stay tuned to House Enthusiast in coming weeks for future posts about other meaningful architectural terms, and don't hesitate to email me Katie@katiehutchison.com about a term that you'd like me to address in What does the architect say?.